Oase AirFlo LM sets new standards in the areas of lake aeration and decoration: The axial propeller technology ensures impressive and unequalled water flow rates of up to 295,000 l/h – for an optimal apply of oxygen to the lake. The three decorative, voluminous water patterns can easily be changed. Wholly, in keeping with the OASE Plug’n’Spray principle, the Oase AirFlo LM is particularly easy to install: Thanks to the bayonet technology the foamed float can be placed easily on the motor housing and screwed in place. 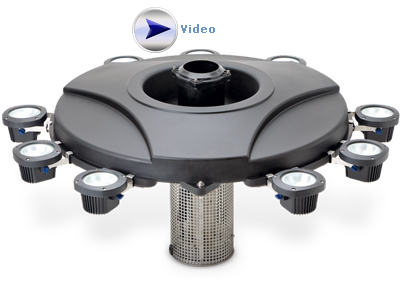 In addition it is possible to integrate up to nine lights thanks to an innovative stainless steel connector system. An ideal supplement for attractive illumination that is particularly easy to install. A maximum of 9 lights can be accomodated by one Air Flo LM. High Quality design with corrosion-resistant filter basket and suspension. Easy, secure anchoring of aerator, thanks to the fastening material included in the scope of delivery. The 400V version comes with a ready to connect, 5 pole CEE connector and motor protection switch.